Talented local schoolgirl, Kitty McDermott, is raising funds to participate in an exciting exchange programme with Ugandan schools. The enterprising student is crafting unique home decorations and gifts which are now being sold on her behalf at RE:SOURCE Vintage in St. Austell. The Ugandan Exchange Visit provides a wonderful opportunity for over 20 local students to visit Uganda, taste the African way of life and spend quality time with students from their sister schools located near Masaka. Most of the children in these schools have been orphaned, either through HIV / AIDS, malaria or war. Yet they are so happy, positive and eager to make the most of their lives; making them terrific models to English students. During the visits Richard Lander students get support in many ways: working in the school as classroom assistants teaching English to primary aged children, helping renovate and paint some of the school buildings and orphan houses, as well as working on the attached farm milking cows, harvesting crops, and helping with some carpentry projects such as making pig pens. Kitty has been making a number of gorgeous homewares in her spare time including wall mounted papier Mache deer heads and pretty hanging hearts, all of which are on display and available to purchase from the popular RE:SOURCE Vintage shop on Church Street. This is a wonderful opportunity for local students to develop a global perspective and their understanding of community; which will hopefully shape their futures towards a more caring, just and sustainable world. Pop into RE:SOURCE Vintage next time you are in St. Austell and support Kitty in her ambitions to help this developing community she cares so deeply about. 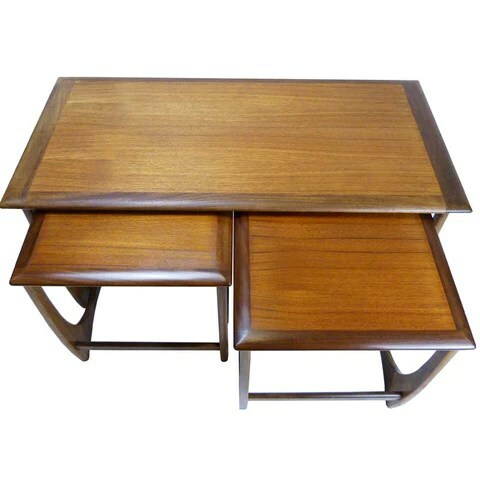 Kai finished his furniture maker apprenticeship in 1948 and two years later he was accepted into the Academy of Fine Arts where he studied furniture design under Kaare Klint. In the mid 1950’s he opened his own design office and began working alongside Schou Andersen Møbelfabrik; famous for the popular #42 dining chair which is still sought after for not only it’s beautiful looks, but it’s comfort. 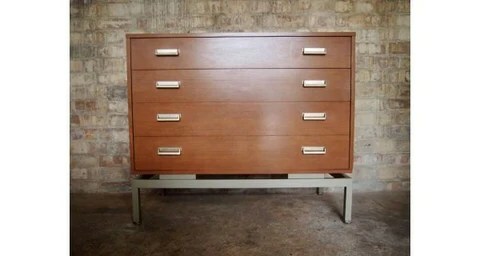 It has become one of the most iconic Danish modern pieces of furniture. Throughout his career Kai has been associated with some of the best known Scandinavian manufacturers in the production of his fabulous designs; the likes of Kjærsgaard, Fritz Hansen, Tarm og Feldballes, Magnus Olesen, Fritz Hansen, Axel Kjærsgaard, and Heltborgto, name a few. From 1956 to 1965 Kai was responsible for organizing a regional Furniture Fair, and from 1966 to 1970 he was the driving force behind the renowned Scandinavian Furniture Fair. As a designer he created Danish mid-century furniture for all walks of life; from tables, writing desks and sideboards, to chairs, tv stands and bar cabinets. 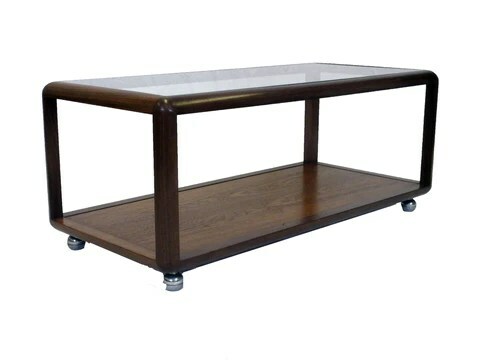 Most pieces were manufactured in teak or rosewood. One of Kai Kristiansen’s most famous designs is the FM Reolsystem, a shelving system which was designed to offer maximum flexibility with endless possibilities to combine wall mounted shelves and cabinets to fit any wall in any home. Widely popular not only Scandinavia but also throughout North America and the rest of Europe for it’s flexiblility and design; the simple use of metal bars which fix to the wall, and use of desirable wood, completes an amazing yet practical look. The use of straight clean lines and quality wood finish is simply gorgeous. This fabulous shelving system and others are available to purchase from RE:SOURCE Vintage, you can find more photos and info here. Within just two years of trading, we have delivered fabulous upcycled and refurbished mid-century furniture all over the UK, into Ireland, and as far afield as Portugal but an order from Australia is our furthest flung customer yet. 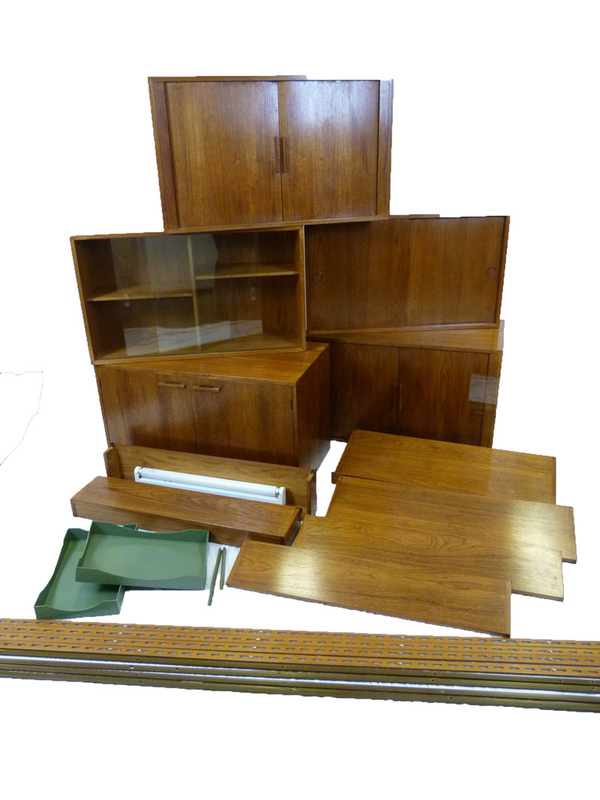 This beautifully restored 1950/60s McIntosh teak sideboard was spotted online by a customer who was looking for an authentic Mid-century Modern piece to grace their home. All furniture sold by RE:SOURCE Vintage are items that have been rescued from landfill and brought back to life by people in the local community who are looking to progress or rebuild their lives. RE:SOURCE provides a safe and inclusive environment for people to gain confidence and learn new skills in a bid to reduce the effects of social exclusion in the county. The sideboard, which caught the eye of our antipodean shopper, was in a very poor state on arrival at RE:SOURCE having been stored in a garage and being utilised as a workbench and tool storage unit; it was badly faded and discoloured, and marked with various stains and paint marks; making it almost unrecognisable as a highly sought-after, mid-century modern piece, designed in the 1950s. 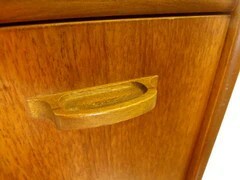 After each of the drawers and cupboard doors were removed every piece of precious teak was painstakingly stripped by hand and indulged with a rejuvenating wood treatment to bring it back to its former glory. With expert guidance and support from our experienced cabinet maker and Workshop Lead, Nick Clegg RE:SOURCE’S volunteers and trainees transformed a tired sideboard into a stunning and desirable addition to a modern home. We love seeing these drastic transformations, its great to see history regenerating and iconic designs receiving a new lease of life. This piece was the ultimate challenge for our trainees and a real testament to how their skills have progressed during their time with us. The fact that customers are willing to cover global shipping costs to secure a RE:SOURCE Vintage product is an indication of the standards that they have achieved and we are very proud of. Well done to all the ladies and gentleman involved in reviving this piece!